Miss Indiana's Outstanding Teen is the official preliminary to the Miss America pageant. 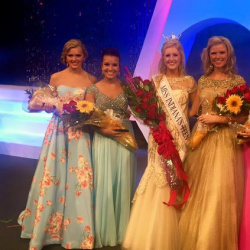 The winner of Miss Indiana's Outstanding Teen represents Alabama's Outstanding Teen at the Miss America’s Outstanding Teen pageant for a chance to win the title of Miss America’s Outstanding Teen. Miss Indiana's Outstanding Teen has four phases of competition that include: private interview, on-stage question, talent and evening gown. In order to compete for Miss Indiana's Outstanding Teen must be at least thirteen (13) years of age on the first day of the State Competition in which she competes and must not be older than seventeen (17) years of age as of July 31st in the calendar year of the State Competition in which she competes, unless she is 18 years old and has not graduated from high school as of July 31st in the calendar year of the State Competition in which she competes have won a preliminary title. Additionally, to qualify you must be a female who has never married and who does not have any children.